This is Part 3 in our series, A Primer on Asset Protection. It has been a while since our last segment, so as a quick recap: in Part 1, we discussed asset protection in the business context. In Part 2, we discussed how to protect modest assets from the cost of nursing home care. In the coming weeks, we will discuss other aspects of asset protection for individuals in other unique circumstances. Today’s topic is probably the most universally applicable. Almost every estate plan contemplates leaving at least some property to surviving family members. There are a number of ways this can be done, but a carefully drafted plan can help assure that your family members and important family assets are adequately protected. Many parents want to assume the best of their children. Perhaps it is for this reason that many parents hope that when they are gone, their surviving family members will peacefully decide among themselves how to distribute Mom’s or Dad’s remaining property. Unfortunately, this is often not the case. And even when the kids generally get along, there can be hard feelings when, in the absence of an estate plan, children disagree over how to manage, distribute, or liquidate their parents’ property. The possibility of family discord increases exponentially in cases where one or more parent has remarried and there are disagreements about how to share property between surviving spouses, step-children, and children from previous relationships. In most cases, these disagreements can be avoided (or at least diminished) if there is a clear plan in place. For example, parents can talk to their children in advance to determine what (if any) family property holds significant emotional value to their children. A will, trust, or other instrument can provide instructions on which of these types of property should be left to whom. In mixed family scenarios, careful trust planning can often help to soothe hard feelings that might otherwise develop between a person’s children from a previous marriage and a surviving spouse. One common strategy involves the creation of a trust that provides income to the surviving spouse for a period of years (or for life) and then pays the remainder to the original parent’s own children. Every family is unique, so there is no “one size fits all” approach to estate planning. But a thoughtful estate plan will help avoid what can otherwise turn into an expensive and emotionally-draining battle between family members. Family discord is not the only thing that can lead to expensive court costs. Without careful planning, the death of a loved one will often require some level of court involvement to ensure that property is legally transferred to the appropriate heirs and/or beneficiaries. When a family member passes without leaving any plan at all, that family member’s assets will be administered according to the statutory rules enacted by the state legislature. These are commonly referred to as the rules of intestacy (the term “intestate” refers to the estate of someone who did not leave a will). In such a case, the court will appoint someone (usually a family member) to serve as a Personal Representative of the deceased person’s estate. The Personal Representative will distribute according to the pre-established rules of intestacy and will be required to report on his or her progress to the probate court. It is not always easy to follow the rigid set of rules enforced on all intestate estates, and it is often very expensive to go back and fix prior mistakes. When a family member leaves a Will, that Will serves as a set of instructions to the probate court. In many cases, the Will can waive certain procedures that would otherwise be required of the Personal Representative (such as the need to pay for a bond as protection of the probate estate). The Will also generally contains specific instructions regarding the way that property should be distributed. A well-drafted Will will not itself avoid probate, but it often makes the process much easier and potentially less costly. One of the best ways to avoid probate altogether is through a trust-based estate plan. A thoughtfully-drafted trust will include clear and legally binding set of instructions for the administration and eventual distribution of assets. Trusts can also provide a great deal of flexibility to an estate plan. Under ordinary circumstances, this plan can be executed without the need for court involvement. Nobody likes to pay taxes. Several years ago, the primary estate planning concern for most families was simply: “how can I avoid the estate tax?” At its current rate of 40%, he estate tax is still a very concern for a lot of people. However, now that estates with less than $5.49 million are now exempt from estate taxes (and Congress is considering abandoning the estate tax altogether), income tax planning has become an increasingly important consideration as well. Families with $5.49 million dollars in assets, or who anticipate they may have assets worth that amount in the foreseeable future, can plan now to ensure that not all of their family wealth is trapped in Mom’s or Dad’s estate (and therefore subject to estate tax) when they pass away. This is often accomplished through gifting strategies, the creation of one or more trust(s), family limited partnerships, charitable planning, or other mechanisms. For those unconcerned with the estate tax (and even for those who are actively planning to avoid the estate tax) there are some income-tax planning advantages to keeping assets in Mom’s or Dad’s estate when they die. For example, under current tax laws, property that is transferred upon the death of its owner receives a “stepped up” tax basis. For assets that have appreciated in value since they were acquired, this is a great way for families to escape income tax on that appreciated value. Assets that stay in Mom’s or Dad’s estate when they die get this “stepped-up basis” while assets that are gifted before death do not. Protecting against liabilities may be the most powerful reason to use a Trust-based estate plan. With few exceptions, you cannot create a trust for your own benefit and protect that trust’s assets from your own creditors. At the same time, in Arizona (and in most states), you can create a trust for the benefit of someone else and protect it from their creditors. There are a number of ways that trusts can be carefully tailored to meet the specific asset protection needs of an individual or family. One of the most important elements of an asset protection trust is the standard upon which a trustee is permitted to distribute assets to a beneficiary. The trustee is ultimately responsible for administering and distributing trust assets. When assets are not owned outright by the trust’s beneficiaries, a trustee can help ensure that a beneficiary does not needless waste trust assets for frivolous or self-destructive purposes. This is also a way to limit a beneficiary’s creditors from accessing trust assets. Of course, this is just a brief overview of some of the ways an estate plan may be an effective tool for protecting assets that are left to family members or other beneficiaries. 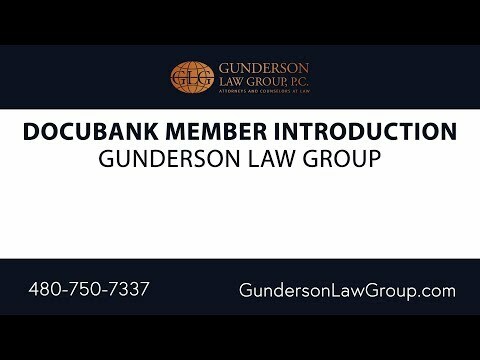 If you have specific questions or concerns about asset protection issues for you or your loved ones, please contact the attorneys at the Gunderson Law Group, P.C. in Mesa, Arizona. We serve clients in Mesa, Phoenix, Tempe, Chandler, Gilbert, Scottsdale, as well as throughout the state of Arizona, Nevada, and throughout the world.